Welcome to the Bugatti Owners' Club and Prescott Hill Climb. The Club was established in 1929 with the express objective of promoting motor sport and pastime of motoring; to hold and arrange races, matches, competitions and time trials. The Club welcomes all motoring enthusiats. The Bugatti Owners’ Club (BOC) purchased the Presdcott estate in 1937 and commenced converting the muddy, rutted drive into a speed hill climb ready for the opening rally in April 1938, when the current Club President, Earl Howe, opened proceedings by driving his type 57 Bugatti up the Hill. Today Prescott is the home of the Bugatti Owners Club. We hold a wide variety of clubs events throughout the year both here at Prescott and within the UK and overseas. The Bugatti Owners' Club has over 1700 members world wide and any enthusiast may apply for membership.There are still over 1500 Bugattis in existence worldwide and you do not have to own a Bugatti to join the club. Prescott Speed Hill Climb, based just outside of Cheltenham near Winchcombe in the beautiful Bredon Hills of Gloucestershire, is home to one of the world's most prestigious motor racing venues. 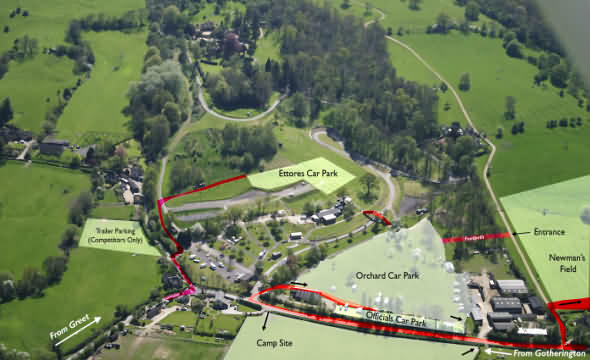 Set in 60 acres of glorious Cotswold countryside, the estate not only provides a beautiful setting for a range of classic car and bike weekends, but also hosts major motor racing championships. The 1127 yard course rises over 200 feet via short straights, fast and slow corners and a breathtaking hairpin, with the fastest modern racing cars completing the course in an exciting 36 seconds. The action can be viewed from strategic points along the course as well as from the restaurant terrace. Visitors and competitors alike can enjoy an exhilarating days racing plus vintage cavalcades up the Hill. A detailed exhibition tells many aspects of the Bugatti story. The artistry and individuality are demonstrated by photographs, models, diagrams, mechanical components and complete cars. Visitors are welcome to look around the exhibition during normal opening times for an entrance fee of £3.00. By prior arrangement we can provide informal talks or lectures with slides. Group visits can be tailored to your requirements. The photograph and document archive as well as the library are available for academic research. Also during Hillclimb Events and at other times by arrangement. See also pictures of the Vintage Classic Car 75th Anniversary meet at the Three Counties Show Ground on 8 August 2009. Ettore Bugatti (1881-1947) is perhaps most famous for his racing cars of the 20s and 30s which, as well as winning races, have been acknowledged as works of art. He was the son of Carlo, an acclaimed and successful designer of furniture, interiors, pottery and jewellery. Ettore's brother Rembrandt became a sculptor, of international renown. Having produced several car designs from 1899 for other companies, Ettore Bugatti set up a small factory in France in 1909. From there for more than 30 years he invented, designed and produced, with awesome variety, not only cars - which ranged from his innovative and successful tiny racing car in 1911 to the luxury limousines and grand touring cars of the 20s and 30s - but also engines, machine tools, railway rolling stock and many other examples of twentieth century industrial design. For Current Year Events - see Cotswolds Calendar.